You may have guessed, from all the videos of my recent Disney World trip, that I saw a lot of the Disney Princesses. 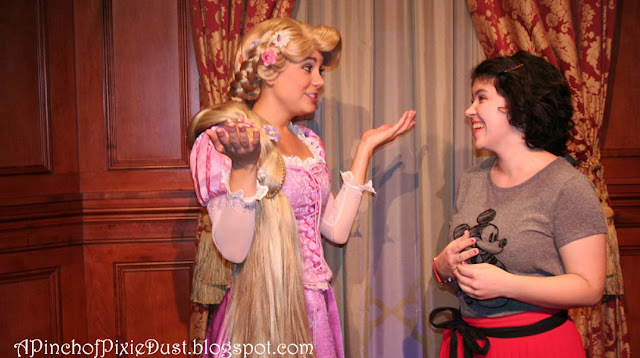 And much as I love chatting with royalty, I actually was on a princess mission with those meet and greets! I'd been thinking about how difficult it can be these days for a nice, charming princess to find herself a nice, charming prince. Well, who better to ask for some advice than the Disney princesses themselves?? I would SO be up for marrying a merman. Or going on a Magic Carpet ride! But to see all the fun and princess advice, you'll just have to watch the video! Love. This. Video! All of the princesses are so cute and gave some great advice. You are so brilliant. I love this so much. SO fun to see how the characters reacted and also how well they do with on the spot questions like that one. Thank you so much for doing this! Still giggling over Mulan. 'I got him to fall in love with me by pretending I was a boy.' Then the look on her face which says - 'That came out SOOOO wrong.' Can't wait to hear all about the cruise! I loved it!! You did an awesome job and what a wonderful idea! !